This always and deservedly popular Simon & Halbig model is difficult to characterize as she was made and marketed prior to the inception of the “ character doll “ series of about 1910 so not really a “dolly face“ yet still not quite of the era of the “character doll“. Nonetheless she has significant individual “character“ expression with almond shaped eye cuts, thick and three dimensional enameled brows, deep brown glass sleep eyes, an open smiling mouth with four porcelain upper teeth, deep dimples in the chin and cheeks, distinct philtrum in upper lip, and pierced earlobes. The head is incised “ 1279 S&H D.E.P, Germany 13 ½ “, and she stands 27 ½” ( 70 cm ) tall on the original fully articulated wood and composition body with original light yellowy varnished patina. The antique light auburn mohair wig with side part is most likely original. The costume has been well constructed of cream silk and pink thread and lace trim with an elaborate chapeau with wide upswept brim and cloth flower adornment. The antique sheer pink undergarments could be original and the white silk covered shoes possibly as well. One should not overlook this doll nor her importance be discounted as one of great quality simply because “she has an open mouth “! ……..US$ 2,250. Lovely cabinet size closed mouth Kestner pouty child, with head incised ” 7 “, 11 1/2 ( 29 cm ) tall with brown sleep eyes, chubby cheeks and double chin, pale bisque with nice pale cheek blushing, well painted lashes and thick multi stroke brows, on the original early chubby fully jointed wood and composition body with straight wrists and separate ball joints at the elbows and shoulders, all with fine pale shiny original patina. She retains her original blond mohair wig over plaster pate (detached ), and wears a beautiful pale aqua and white cotton and silk dress with lace trim and well coordinated hat, old white underclothes and stockings, and very pretty antique white leather shoes with pom pom shoe strings. A very nice doll in a most desirable size. US$ 2,250. 14 ½” ( 36 cm ) baby with head incised “ G. made in Germany 11 J.D,K. 211 “ with brown glass sleep eyes, open/closed mouth with lips slightly parted but showing no teeth, on the original five piece bent limb body in very good condition and original finish. He wears his original dark blond bobbed mohair wig over plaster pate (still intact) and a pale yellow crocheted one piece outfit fitting the age of the doll. 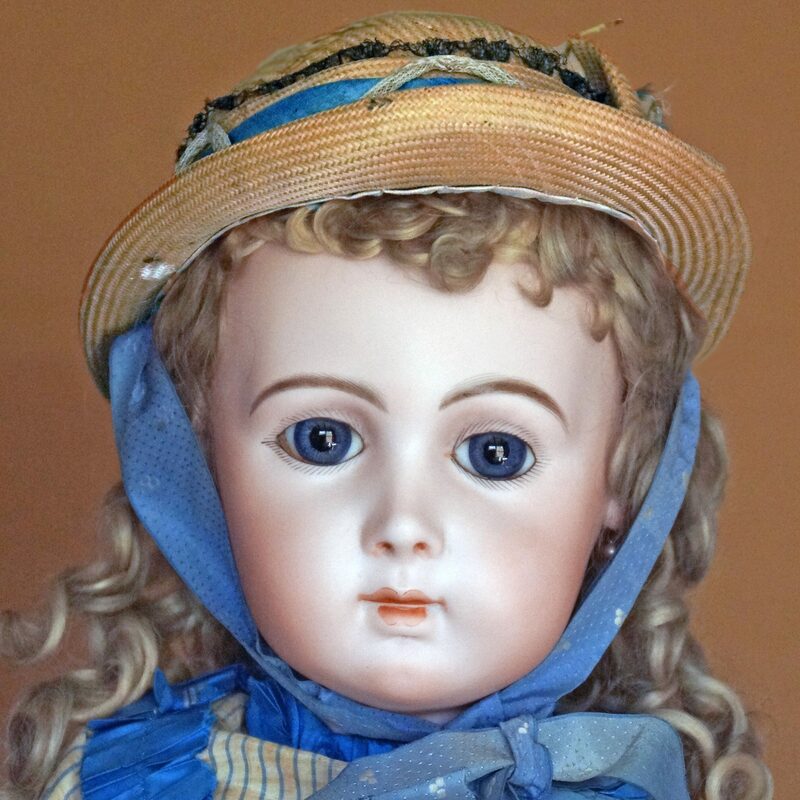 A nice example and proof of why Kestner is well regarded as a quality doll maker!……………………………US$ 275.